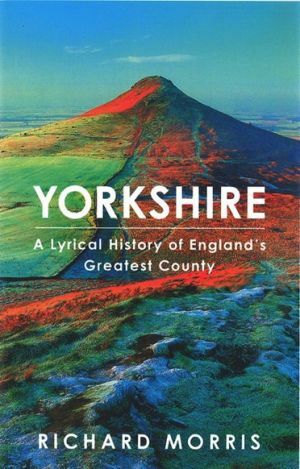 Richard Morris's new book about Yorkshire came out this year to much public interest. So much interest that it was chosen earlier in the year to be the BBC Book Of The Week read out each morning. That's how news came to the village about it. Reading the book itself, I thought was a joy. Fascinating, very varied, it gives a quite distinctive history of the county, infused with some of the hidden history of Professor Morris's own family that he unearthed as he wrote the book. That mixes in with early geology, battles, cathedrals, aviators, Roman drain builders and working people. The way in which the condition of their lives was improved by protest and law change is a theme of one whole chapter. The thread that runs throughout says....here is a part of England full of much really interesting stuff that you didn't know about....and it's effect on the rest of the country was profound. So we asked him to come and talk about writing the book and, to a hall full of people, he did just that on 18 November last. To make the point about hidden history all around us, he began with an aerial photo of Long Street in Easingwold. It showed the road going north with its Georgian houses on either side. Who knew that the road cut through medieval settlements, traces of which are still visible today but on a completely different alignment? It was a fascinating afternoon and the comments to me afterwards were really positive. Sunday afternoon seems to work as a time to have events in the village. Hopefully, more will follow. Thanks to everybody whose efforts made it work, from inviting the speaker to serving good wine at the bar. Professor Morris is Emeritus Professor of Archaeology at Huddersfield University and has had a long and very varied career in archaeology, university teaching, writing and research. He was for a long time director of The British Council for Archaeology and has particular interests in writing about the history of battlefields, churches and cathedrals and flight. His next book to be published will be a biography of Barnes Wallis, the designer of airships, the WW2 bouncing bomb and the Wellington bomber, all with strong Yorkshire connections.